The new Vogue Knitting is here! The new Vogue Knitting is here! 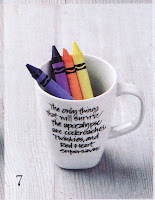 Earlier this year, a staff member from Vogue Knitting requested samples of my knitting mugs. I hoped one would end up on the pages of the magazine, but didn't want to get my hopes too high. But Vogue Knitting didn't let me down -- my mug is pretty much right in the center of the "What's New, What's Now, What's Next in Knitting" article. 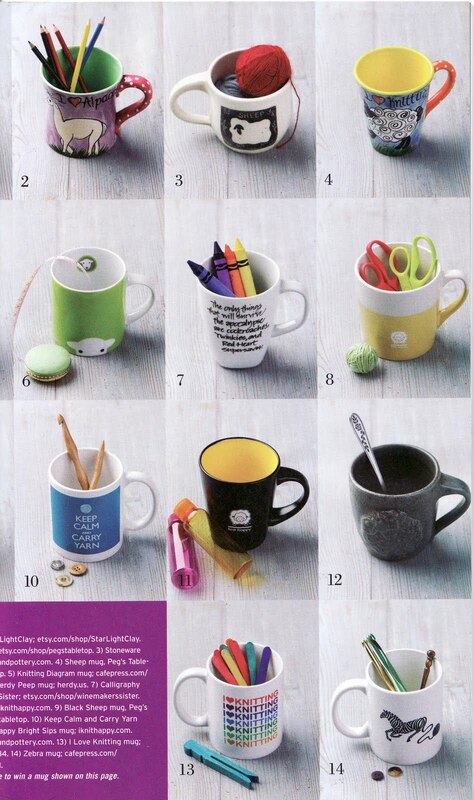 The page, called "Mug Shots," is filled with all sorts of cute knitting-themed mugs. I love you Vogue Knitting! And, of course, the amazing wit of Stephanie Pearl-McPhee. 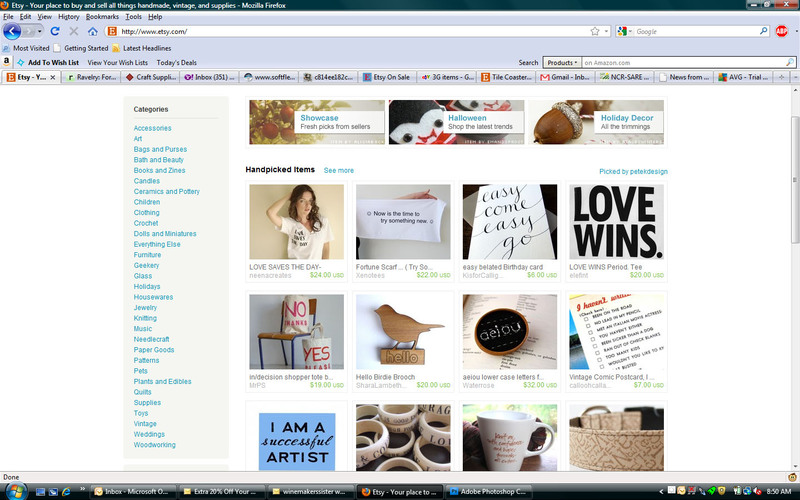 It's been quite a while since any of my items were on Etsy's Front Page. Getting something into a front page treasury is the best free advertising you can get! This week I broke the no-front-page streak with two FP treasuries! 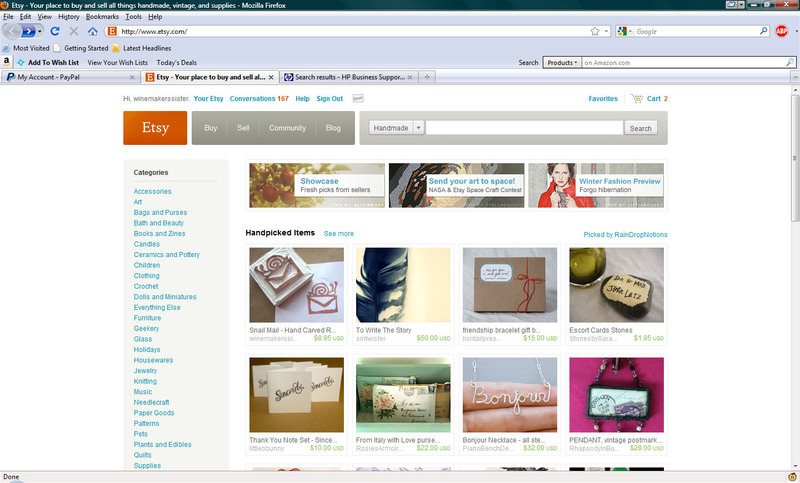 If you have an Etsy shop and would like to be notified when one of your items is on the FP, visit Statsy, click on "Featurator," and sign up. linen, again..., originally uploaded by * a n i t a *. 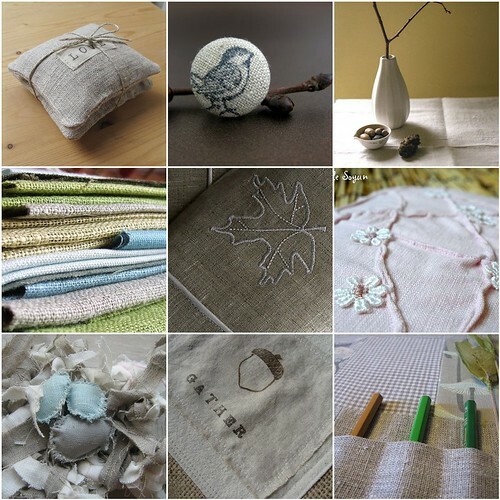 I love the look of linen with hints of soft color. I was searching for something like this on Flickr, and was thrilled to find it -- and that it included my linen bulletin board (bottom right). Question 2: Are you attending any Fiber Festivals this autumn? If so, which ones and why? Autumn is too crazy for me to try to go out of town to a big fiber festival. Luckily, the Spinner's Flock in Chelsea (about 15 minutes away) has a very nice festival. They held their fall festival on a Sunday (much better for me than a Saturday) and I was able to get over there. It was terrific! And quite a bit larger than I expected. 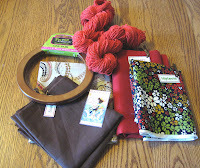 I bought a few things (some hand-dyed roving, a "second" fleece at an incredible discount) and lusted after lots more! I haven't gotten involved in their group -- mostly because they meet on Saturdays. But I'm going to try to attend the November meeting. I want to get back into spinning! Quest ion 3: What is your favorite cool weather recipe? I love soups in cold weather! My favorite is easy and really yummy. Turn the crockpot on low and cook all day. Shortly before serving stir in 1-2 cups of julienned fresh spinach. Cook just until wilted. Serve. Easy and warming! I've narrowed down my swaps on Ravelry to a few favorite groups, and the ones run by Amy (DeathbyYarn) are some of the best. The "Recession Special" swap runs for 3 months. You are to send your spoilee one package per month, and at least one package needs to include a handknitted item. The package to the left is the first installment. It's adorable! My spoiler found a cute pouch -- originally intended as a makeup bag, but perfect for knitting supplies. She filled it with little treats. And the best part is the yarn -- 100% baby llama in a gorgeous bittersweet chocolate color. And sooooo soft. Lovely! A wonderful little swapping group on Flickr ("Just for You FQs") is currently holding a swap for fat quarters. This time we're looking "Beyond Cotton" at other natural fibers. Marilyn sent me the most wonderful collection of linen, bamboo, and wool (a vintage kimono fabric) along with two skeins of Elsebeth Lavold's Silky Wool in a lovely autumn orange. Marilyn knows me so well! It's all quite perfect! 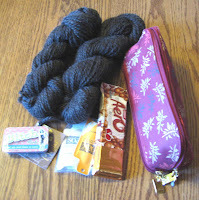 I just received a thi rd wonderful package -- this one was for the "Knitter's Holiday - Novel" swap. My partner really looked at my profile and selected very carefully. As a result, it's all absolutely perfect. "Boutique Knits," a great book with lots of knitting patterns for vintage-looking scarves, hats, bags, and gloves. Two skeins of Manos wool (yum! ), handmade stitch markers and tags, and notecards and a reusable shopping bag. Thank you so much! On the eve of my birthday (when I'm having trouble telling Bob what I'd like as a gift), I have to say I feel really content with my life. 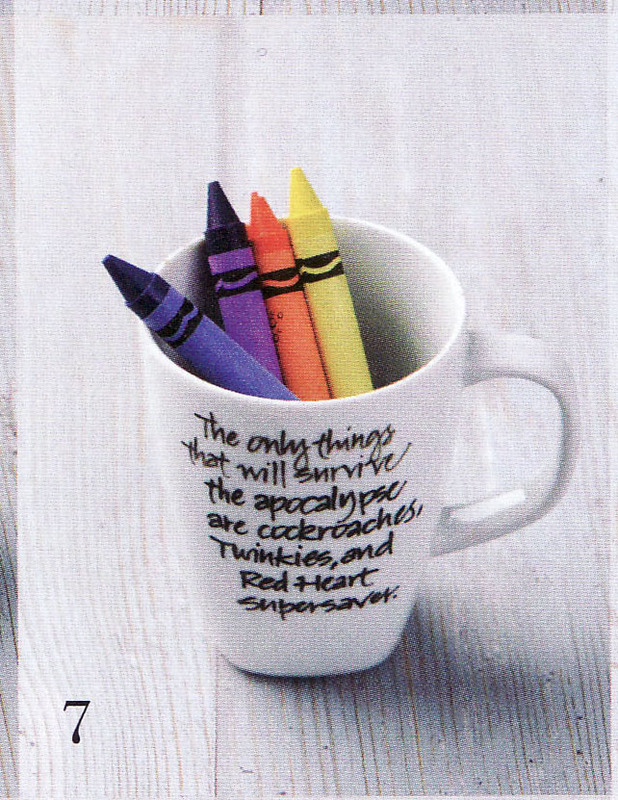 And those things that I'd really like (less stress at work...) cannot be purchased. That being said, if I won the lottery, I'm sure there are many great uses I could find for the money! Sorry to be hibernating for so long! I'm joining a swap that will force me to post to my blog again -- it's a good thing. Knit. I learned as a child and then took it up again when my son was a baby. Yes. I did it a lot in college and am just getting back to doing it again. I really don't use synthetics or blends that include synthetics. I don't really work with anything lighter than dk weight. I'm not a sock knitter. Lots of indie dyers/spinners. I think it's fun to try local yarns and/or favorites of my partner. I knit to relax and don't have a lot of time to do it, so I tend to stay with relatively short, simple projects. Hats, scarves, (I love) bags, capes & ponchos, some sweaters. I also love to felt. Just finished a vest for Warm Woolies and a baby sweater for a friend who just had a baby. Trying to finish the Hogwarts sweater for my very tall son. Since Ravelry ( where I actually have pictures of my FOs), I think this child's Einstein sweater for Warm Woolies is my favorite. 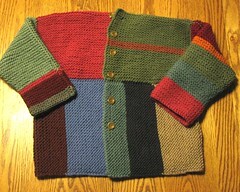 I used up lots and lots of bits of Mission Falls wool and it made a really colorful sweater. When my son was that age I think he would've really liked such a colorful sweater. Nothing that I can think of offhand. I got a yarn winder as a gift a few years ago. I found a swift for $1 at a church sale -- the ladies there didn't know what it was. I have to hold it together with a clamp, but it works just fine. I store like needles in some vintage needle holders. Then everything ends up in a large tupperware container. Cookbooks, vintage kitchen stuff, vintage linens (and of course, yarn, fiber, and fabric!). Dark chocolate and maple are my favorite sweets. Green tea is my favorite. I also like light citrusy scents, herbals, and lavender. Do you have any online wish lists? (Amazon, Loopy Ewe, etc.) Please include a link for your pal. Husband, a mostly-grown-up kid and his girlfriend currently at home, 1 Golden Retriever, our six cats, and son's two cats. Nothing that applies to this swap. Is there anything else that you would like your pal to know? This year we've had a lovely crop of wild black raspberries along our fence line. For the past week or so, we've been picking some for cereal, yogurt, and just snacking. Last night there were enough to pick 3 quarts at one time. 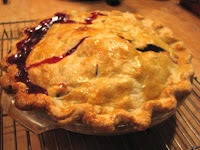 Time for pie (and some left over for snacking)! I'm not sure I've ever made a wild black raspberry pie before. The flavor is extremely intense. It pretty much needs something like ice cream or cream to cut the intensity. But, yum! Don't forget that the attack runs all night. So if you don't get to the website right away, you can still participate. Visit the Handmade Movement website for more information on Sneak Attacks. Phippsart, the papa of Sneak Attacks, will be away today for the holiday. Since I'm hosting the attack today, I'll be posting the shops here at 7:00 pm EDT.